Selecting a subject for a Mini Vacations piece is usually influenced by the story connected to it. Sometimes the story is based on my experience of being in the place at a particular moment, and sometimes the story comes from my curiosity and research of the subject. For Mini #75, “We Stand United, Toronto”, it was both, as the research unearthed a surprising story. Last fall I travelled into Toronto for a brunch meet-up with my son and his girlfriend, who were visiting from the US. 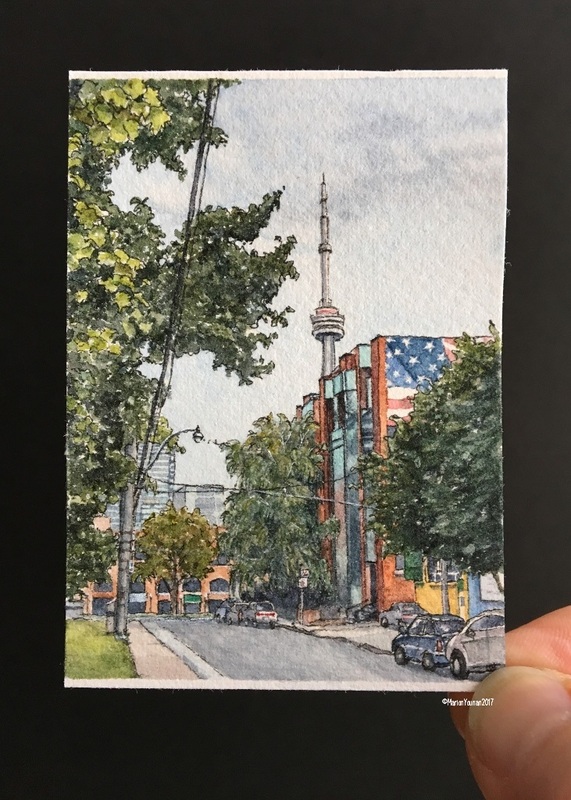 I also wanted to take some Toronto-themed photos as I needed to paint more Toronto Mini’s to replenish my inventory. 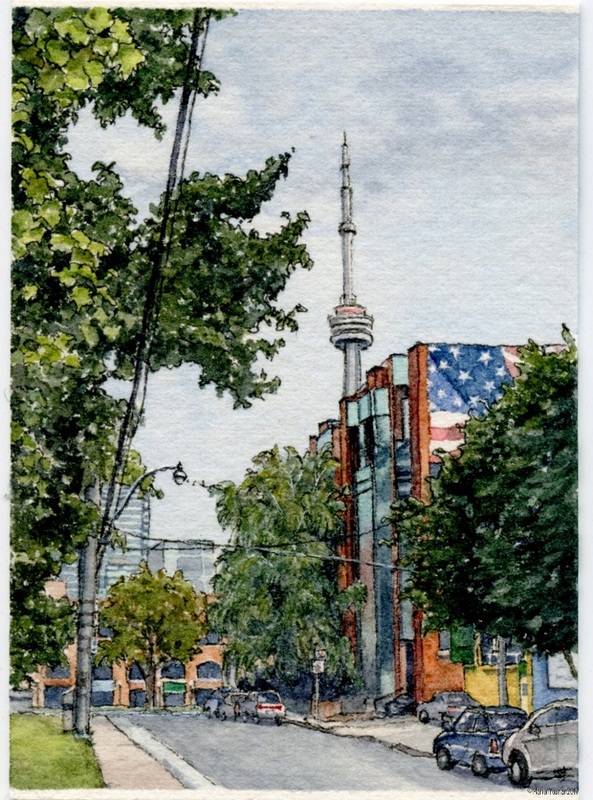 Upon heading back to my car, I walked toward this scene – the CN Tower and a snippet of the US flag on a building happily conjoined on this leafy street. I smiled at the coincidence of this image, as I had just seen my happy US-based children in Toronto, so I took a photo. Months later when I got around to drawing the scene for a Mini, I became curious about that flag. As I could only see a corner of it, I assumed it was either some graffiti or part of a larger piece of street art, as this flag can be seen in a lot of local street art. 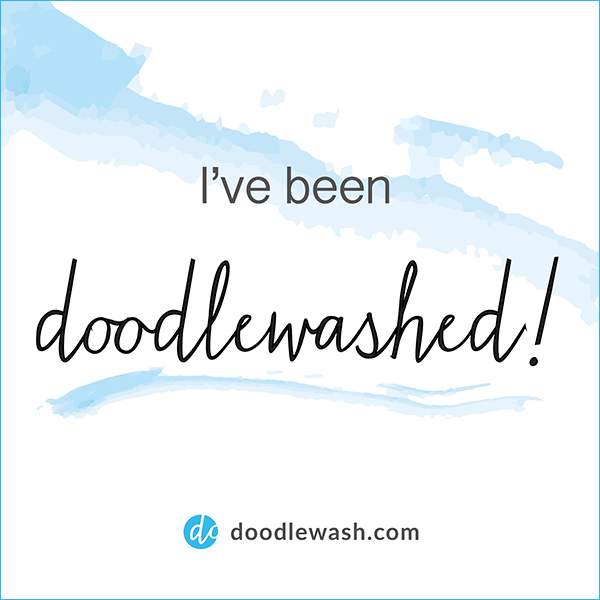 I took to Google to try and discover more about the art or artist, thinking it was a long shot. Surprisingly, there were lots of stories about this image! In 2002, a large flag illustration with the words “We Stand United” was installed on the side of the Nygard International building in Toronto as a sign of support post- 9/11. This clothing company has run campaigns for several years to bring attention and support to anti-terrorism activity in both Canada and the US. The “We Stand United” wall painting is still there and vibrant these 15 years later. So while I initially attached a personal connection and story to this piece, it has a richer dimension now that I know the story of the other piece of artwork on the building.